"[In 1846,] James Polk made prophets of Henry Clay and Daniel Webster by commencing a war with Mexico. Polk's war was a land grab wrapped in self-defense. Texas entered the Union with its southern boundary in dispute. 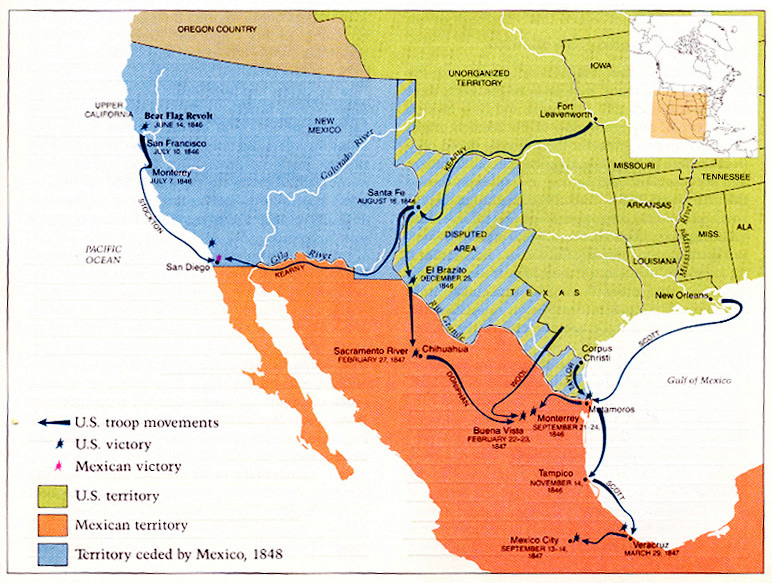 The United States claimed the Rio Grande as the border; Mexico claimed the Rio Nueces, more than a hundred miles to the north. Mexico nominally claimed the rest of Texas as well, never having acknowledged the loss of its rebellious province. But though it responded to the American annexation of Texas by severing relations with the United States, it took no military action to challenge the new regime on its northern frontier. "Calhoun succeeded in slowing the rush to war, but not by much. Congress debated the president's request, with most of the negative comments coming from the Whigs. Some asked whether Polk had done all he could to avoid armed conflict; their strong implication was that he had not. A few went so far as to charge Polk with provoking the war. 'This war was begun by the president,' Garrett Davis, a Kentucky Whig, told the House. Some inquired whether the Mexican attack, if it indeed had occurred as the president said, had been authorized by the Mexican government. Still others rejected Polk's assertion that the soil on which the blood had been shed was American. Some said flatly that it was Mexican; others remarked that ownership was still in dispute. "But Polk knew the American political mind better than the dissent­ers did. He understood that the shedding of American blood --under whatever circumstances -- created an irresistible impulse toward war. A negative vote could be characterized as an unpatriotic vote, and no law­maker lightly risked that. The few surviving former Federalists remembered how their party had wrecked on its opposition to the War of 1812. In the end scarcely a dozen Whigs refused the president's request. John Calhoun haughtily abstained. "Daniel Webster dodged. His conscience and his constituents opposed the war, but as one of those Federalist refugees, he recalled how the winds of war could blow popular sentiment in unexpected direc­tions. When the vote was taken, he was not in the Senate chamber."